As I sit here this Saturday morning, a cup of warm coffee in my hand, staring at the snow-covered landscape out my window, I'm thinking about last Saturday. Between all the bleak, cold, rainy (yes, rainy), and snowy days over the past month, we've had a couple of really nice days. It's typical of the Midwest, really, for this to be the case, so none of us were surprised to see a 50-degree day last weekend sandwiched between two cold ones. I have been fully enveloped in the Winter doldrums, so I wasn't about to let a nice day slip through my fingers. Off we went, then, last Saturday to one of my favorite haunts: Neale Woods. It was relatively dry, maybe about 70%, which is great for walking in the woods. Wet forests make for hard trekking. I was also in possession of my brand new smartphone. I had dropped my old Galaxy S4 (hehe) and the screen quit working, so it was a good excuse to upgrade. I now own the Galaxy S7, and, man, does it take amazing pictures! I didn't even have to filter any of these. 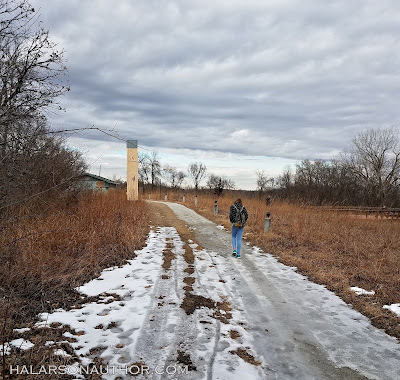 The first pic is Nature Girl walking along the beginning trail moving North from the old Nature Center. This pic is NG and my husband on the viewing platform. Neale Woods sits in the Ponca Hills, which rest on the Eastern edge of Nebraska. Standing on the platform, you have a clear view over to the Iowa Mountains (a.k.a. Loess Hills) which sit on the Western edge of Iowa. You can see the Iowa Mountains in the background under the gorgeous cloud-filled sky. What a view! 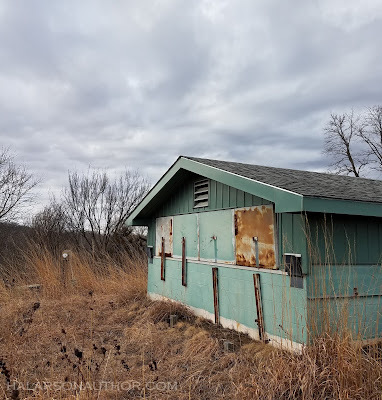 This building here on the left is the old Millard Observatory. It used to be in operation until 2013, and to this day I regret never dragging myself here one evening to see the stars. I love hiking in the Winter months when I'm able. Most people see a barren forest and see no beauty, but I always see beauty in the forest, no matter what the season. Besides, look how far you can see into the woods without the foliage getting in the way. 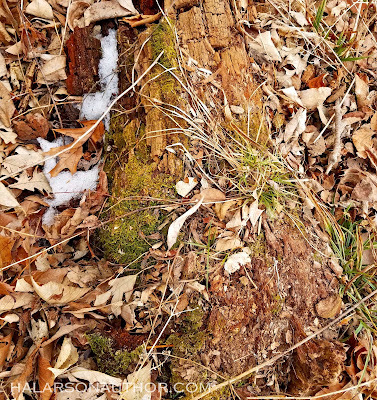 A hint of green moss on this old tree contrasts with the bit of snow off to the left. 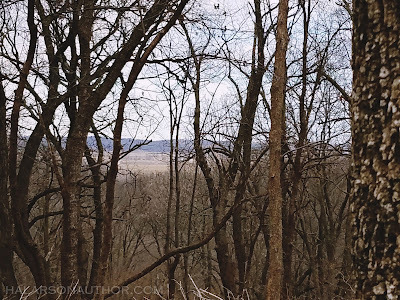 Winter trees leave an unobstructed view across the Ponca Hills to my beloved Iowa Mountains. As we were sadly departing, I snapped this last perspective shot of the old education seats near the parking lot. 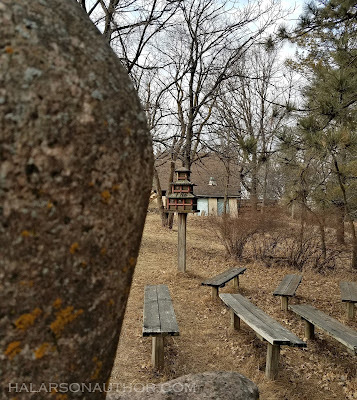 You can also spy the ever-cool pagoda birdhouse. These seats, as well as the birdhouse, are just ghosts now. 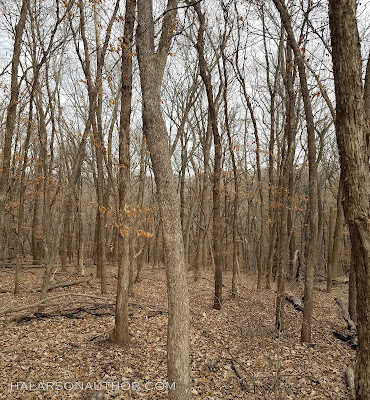 While Fontanelle Association puts the bulk of their money into Fontanelle Forest, they still maintain Neale Woods enough to keep it usable. 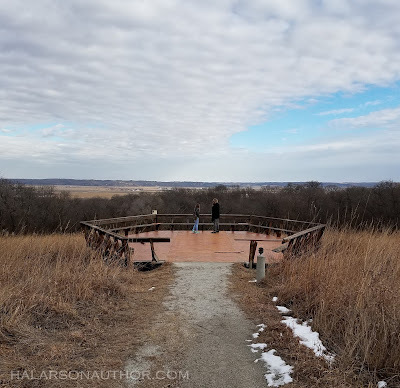 No matter to me, it will always be my favorite place to hike here in the Omaha metro, and I hope it stays open to the public forever.